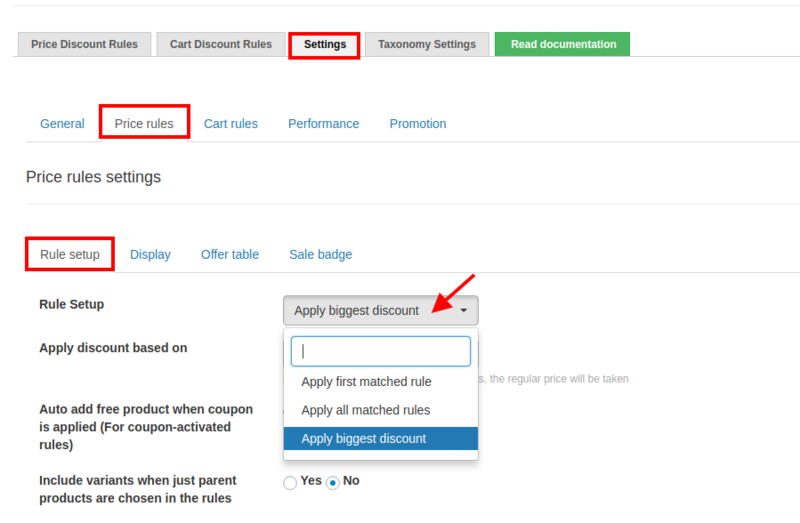 How to set priority of the discount rules to be applied. When you have multiple rules set up, this priority set up will come into action. Woo Discount Rules -> Settings -> Price Rules -> Apply to. The priority really matters when you have "Apply Biggest discount" or "Apply first matched rule"
Ideally, First Matched rules will consider the order of the priority that has set to each rule. Order number 1 will have the highest priority then it goes ascending 2, 3, 4 and so on. Rule 2 : 15% discount if 5 quantity of products on a selected category A are purchased. Apply first matched rule: The priority works here. So if the Priority 2 rule matches first, it takes the Rule 2 and provide 15% discount in cart but not the first one. Apply all matched rules : No priority is checked, both the discounts will be applied accordingly.